Written especially for mothers to read with their children, these storybooks come in two gender-specific editions, for boys or girls. They offer a great way for mothers to instil a love for Scripture in their children from an early age. Each Bible story includes a brief reflection and memory verse. Ages 4-7. 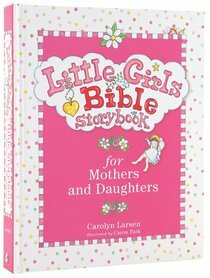 About "Bible Storybook For Mothers and Daughters (Little Girls Series)"
Long beloved by children and parents alike, these classic Bible storybooks have been thoroughly revised and updated for a new generation of children. With whimsical and colorful illustrations, and a larger, easier-to-read font, these Bible storybooks will encourage quality quiet time with Mom and instill in boys and girls a love for the Bible at a young age. Each Bible story includes a brief reflection and a Bible verse to remember, plus gender-specific content to engage boys and girls and apply the lessons they learn to their lives. Moms will love curling up with their little ones each night to share these beloved stories.